Welcome to my new followers!! I would like to start off by saying thank you for all your well wishes and comments on my last post. The cold has left the building and I'm back in business!! I've been quite busy with work, cycling and my hubby's birthday which was yesterday. 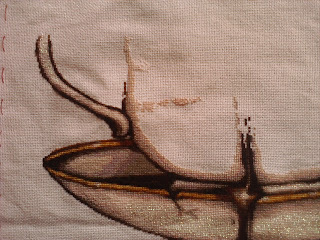 I have been doing a lot of stitching in the evenings too, which has been wonderful!! I hope to work more on Jane, since she's been having most of my attention lately. I think I just need to focus on her as much as I can so I can try and finish one BAP. You see, I have a couple of other BAP's in the wings and I would love to start them, but feel that I need to finish one of the two I'm currently working on. If I have too many BAP's on the go, I feel antsy for whatever reason. Reading too many books at once also gives me that feeling. Oh, and on the topic of books, I've read 95% of War and Peace!!!!! I've only been reading it on transit and can't wait to finish it in a couple of weeks!! Right, IHSW. So I'll be working on Jane, maybe TBF, my secret project and finishing a finish I started when I was sick but couldn't actually finish it. You know what I mean!!! The finishing fairy almost left the building, but I've got her held back and seated drinking some tea. I'm not letting her go quite yet! Then, the Frog Prince visited this morning. He is quite pesky I tell you! All the stitching I did this morning I had to take out. This has been the first time in a long time the Frog Prince has been a problem. Don't worry though, I got him handled and he's gone now!!! Here's my Jane as of noon today. And the flower that the Frog Prince messed around with! I am really loving Jane's flower garden that has sprung up. Each flower has been a lot of fun to stitch, even with the frogging!! I'm working on some birds around the flowers right now...kinda itching to get back to it!! Now onto the Tea Bath Fairy. In my last post I said I finished the handle. What I meant to say is that I finished a full page that had the handle in it. I worked on TBF for quite awhile. I'm surprised it doesn't look like much progress. But then again, it's an HAED! Sorry for the wrinkles but I don't want to iron it until it's finished and I can wash it. Before I get into some info about my giveaway, I want to share with you a little thank you gift I stitched up for Melissa at Words and Blooms. She has been so generous to me, giving me all sorts of lovely linens and for awhile now, I have wanted to make her something special. 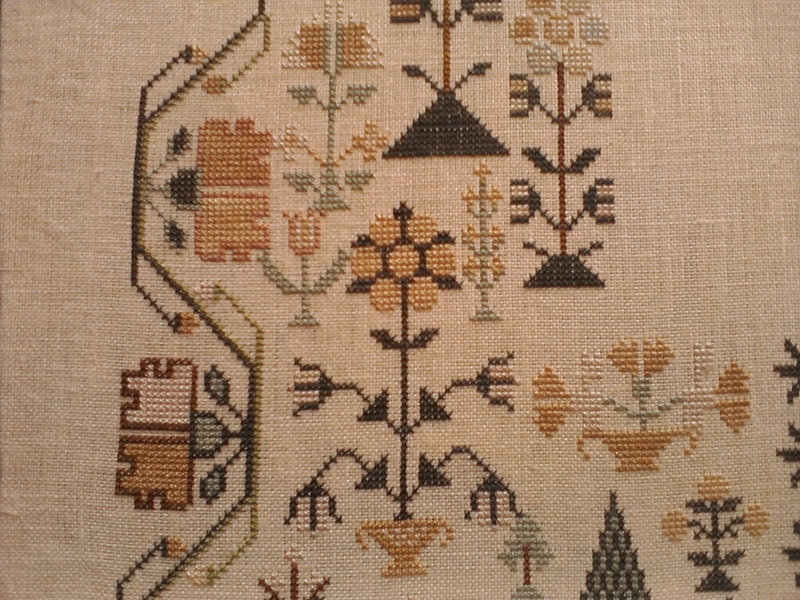 I stitched up a lovely freebie design from Threadwork Primitives. 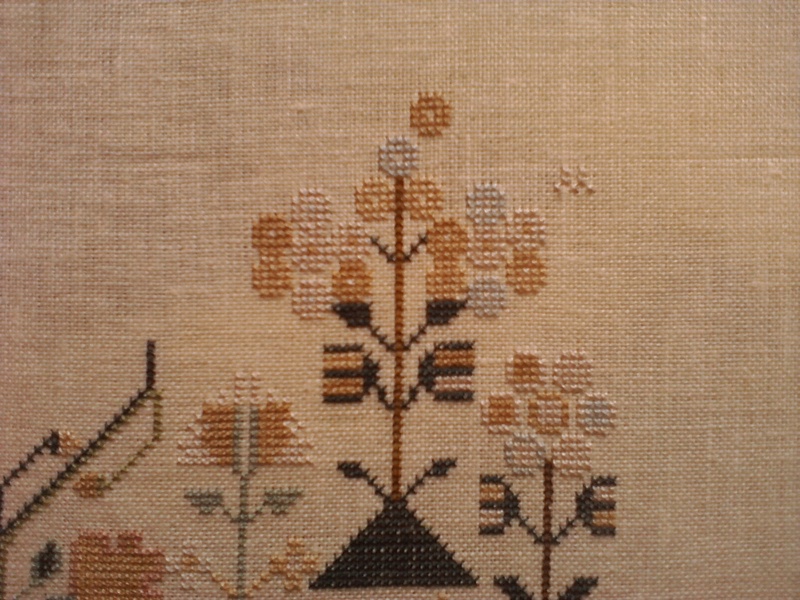 I stitched it on one of her linens, using GAST and Carrie's Creations threads. I am happy that she likes what I made for her and that it turned out rather well!! 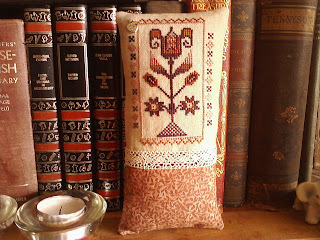 Her picture of the little pillow is much better than mine, so go take a look. She has a lovely blog and often shares amazing photos of her incredible garden and her two cute kitties! Hugs for you Melissa!!! 2. LHN's Bee Pinkeep courtesy of The World's Largest Collection of Smalls (and it would just be the center design which is also in the GOFT magazine. 3. Prairie Schooler's Summer courtesy of The World's L. C. of S.
4. Blackwork with Nancy Pederson. So go ahead and take a look at these lovely little designs and help me choose!!! One more thing. 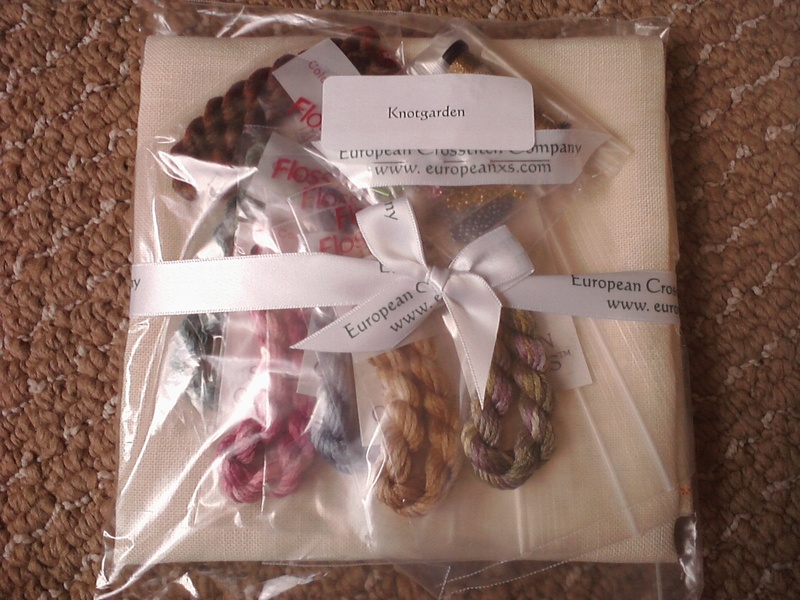 I have received the Knotgarden kit. However, I still need to make my scroll rods before I think of starting it. I'm on the fence about it though. Having three major projects, I dunno. But the silks! And the bling!! They are calling me!! Maybe I can put TBF outta rotation for awhile and start Knotgarden. We'll see!! Titus says good bye and don't even dare think about stealing his toys!!!! Hugs and I will try and catch up with all my blog reading/commenting this weekend!!! 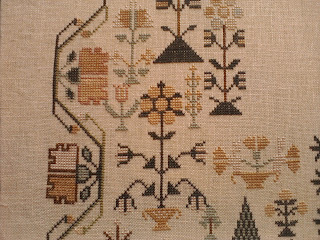 I have a little vote for the 'blackwork'. LOVE Titus!! Oh my word, he's a beautiful boy! Great progress on your projects! I would totally vote for the LHN Bee pinkeep! Ooooh, Ann, Titus is so gorgeous. I love long haired cats, and have never had one. I try and get the one that's least likely to be adopted, and so far, they've all been short haired. Good progress on your stitching. I'm signed up for IHSW too. Hoping to get some more done tonight. I did a lot earlier today, several hours worth (about two forty five to six), so I'm happy with my progress so far. Now I'm trying to get caught up with blogs. None of the designs you chose really speaks to me. Sometimes, I see something and there's an instant, OMG, I need that feeling. But none of yours are grabbing me. Sorry I can't help you out... Hope you're having a lovely day! Wonderful stitching! I hope you'll have a nice hermitting weekend!!! Titus is adorable! Sophie is sitting here beside me & while I was reading your post I noticed her keen interest. I think she has a crush on Titus : ) Your giveaway is very generous! I voted for the PS Summer design : ) Your WIPs are beautiful! You do great stitching! Knotgarden looks like it will be breathtaking! 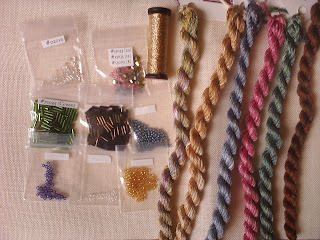 Your sampler is coming along very nicely! Love the colors. So happy for you that the cold has left. Wow Jane is looking wonderful. Your RAK is so pretty. Love to be in your give away and I love all the designs and would be happy with any, thank you for sharing. Jane is really coming a long now and your pillow is just cute. Look forward to seeing the start of your Garden. Your Knotgarden stash is beautiful all together like that. Lovely shot of handsome Titus. Ah Jane. So beautiful. Keep those frogs out of the garden, whatever you do. Silly frogs. Love how the Tea Bath Fairy is going too. I voted in your poll! You're so sweet about your giveaway. Love seeing your Knotgarden kit. I love getting kits! lol! Good luck with all your projects - they're coming along really nicely! :D And give Titus a little hug for me. I miss my kitties so much! Beautiful post Anne! I am glad that you are feeling better. Maybe I got this cold from you?lol! Jane is really lovely. I am loving your progress. What a wonderful gift you sent to Melissa. The Knot Garden kit makes you want to drop everything and play with it now!! Oh man, I voted for that pinkeep. Everything about that screams gorgeous to me! And Titus. If you could get past the claws and just bury your face in the soft belly fur...!! (I only occasionally am allowed that honor with my own fur babies 'cause they must know I'm being silly.) 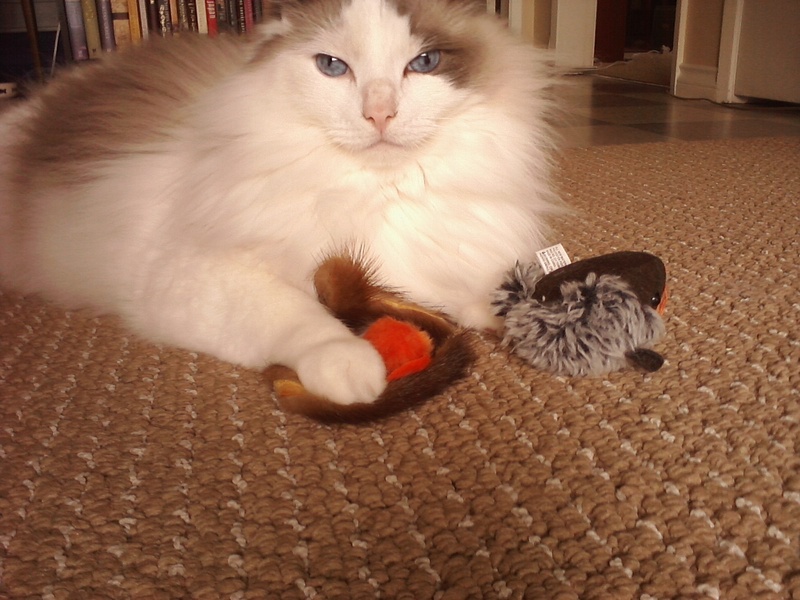 Oh, fuzz therapy. Miracle cure for everything. Nice progress on Jane and TBF. I think you should start Knotgarden (terrible enabler, aren't I?). Cute giftie you made. Glad to hear that you are over your cold. And Titus is so handsome. I choose Prairie Schooler's Summer although they are all lovely designs. I like the idea of a poll for choosing which design you will stitch as a Giveaway. I hope you don't mind if I steal it sometime. Please enter me in the Giveaway or is it too early? Happy Birthday to your Dear Hubby Anne! Great progress on Jane. You've gotten so much done and I love that funky flower garden! And TDF is really coming along too! You certainly have been busy. All of your stitches are looking good! I need to get back to my needle and thread! Your gift for Melissa is so sweet. Love the look on Titus' face! I voted in your poll! Melissa must have been thrilled with the beautiful pin pillow that you stitched for her. Oh.... 'Knotgarden' is going to be beautiful! Decisions, decisions! What a lovely idea to stitch one of the Gift of Stitching designs for your giveaway. "Bee Pinkeep" is beautiful, and my very favorite pick! Eep... Don't you just hate the frog prince. Let's hope he doesn't find his way back for a very long time. Jane and your HAED look great! And that little Threadworks freebie really worked up into something beautiful. How did you ever think of such a gorgeous color to use! I've seen that freebie and paid no attention but I had no idea that it could look as good as that in the right colors! I've stitched that Prairie Schooler Summer design... really fun as all PS pieces are. But you should go where your heart leans. Your stitching is beautiful!! Love that I found your site. Lovely stitching, Anne. And I know - thanks so much for your pin pillow once again. I so love it! 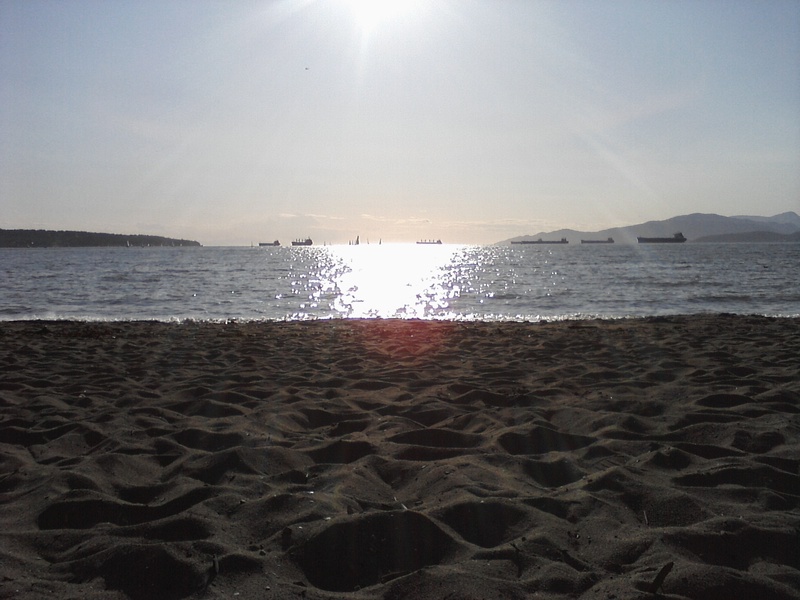 I hope this rain doesn't last too many days before the sun returns. I did sleep really well last night though! Awww TITUS.... TITUS... TITUS... TITUS!!!! What do you mean there's more to the post? HAHAHAHAH!!!! HMBW!!! and HAPPY BELATED BIRTHDAY to Lee!!! Wow!! I love your Jane.. is so elegante and with delicate colors! 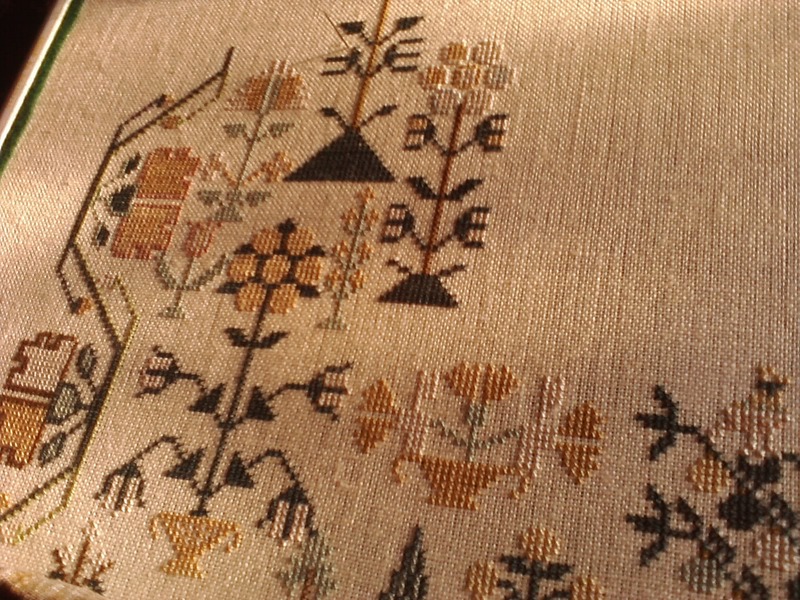 The gift for Melissa is absolutely wonderful, I like very much Threadwork Primitives. Congratulations to your husband, and hugs for you and Titus!! Plant Love! It is the cutest design ever. In that pic your Titus looks cuter than ever!!! Can't wait to see you start Knotgarden.